What is qualitymarketzone dot com? How to Block Referral Spams in Google Analytics? Less than a month ago, I wrote few articles on Ghost spams and how to block an unwanted web traffic via spam referrals. Today, I saw another spam referral in Google analytics – this time, the spammer is qualitymarketzone dot com. This spam referrer has made few entries in my Analytics report which has 100% bounce rate, average session time zero seconds and a hostname consisting of random characters. Well, this kind of traffic is usually called as Ghost spams that does not do any good to your valuable Analytics data. One good thing is, you’ll find these referral traffic only in GA and they don’t access your website. It means, you can’t just block such ghost spammers via htaccess, as they are not really hitting your servers. But the bad thing is, they spoil your GA reports and prevents you from taking any business decisions. How hell is that? Of course, the website is a damn spammer that simply redirects to aliexpress dot com to earn some affiliate commissions. Click “Filters” under “View” column. Enter ‘qualitymarketzone.com‘ (without single quote) in Filter Pattern text field. 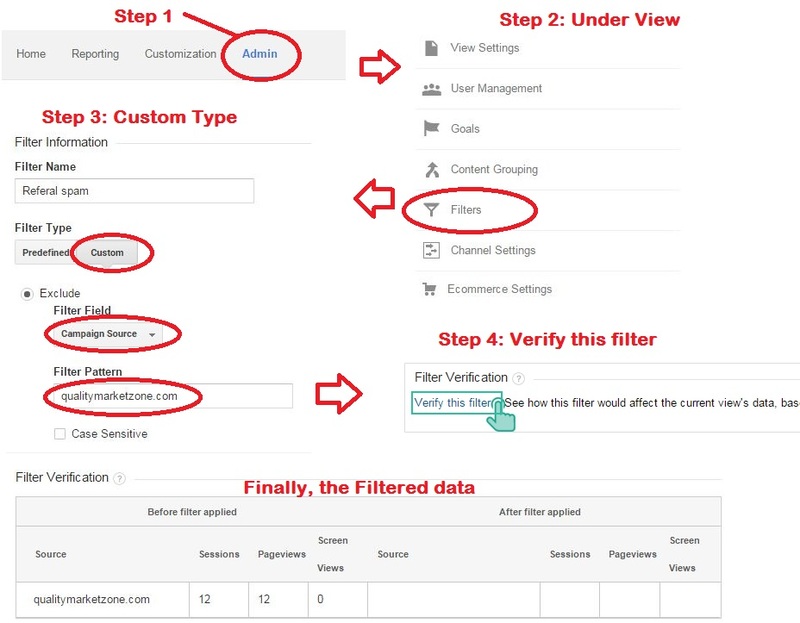 Click “Verify this filter” link to check if the filter would make any difference to GA report. Look out for the resultant table showing the amount of visits from the Spam referral and click “Save“. The below image explains it all. Done! You have now successfully created a filter to block out the spam referrer qualitymarketzone dot com.